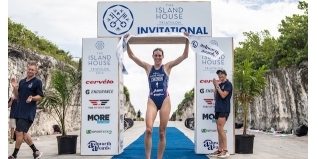 After three days of competition in The Bahamas, Gwen Jorgensen (USA) retained her title at the second edition of the Island House Invitational Triathlon, while Richard Murray (RSA) stepped up one place from 2015 to take the title and the $60,000 first prize. After leading the even on day one, Great Britain's Holly Lawrence - the current IRONMAN 70.3 World Champion - took third place overall. Here is the full report from Day three, which took place on the private island of Highbourne Clay. USA’s Gwen Jorgensen and South Africa’s Richard Murray fend off tough competition to claim victory on the final day of competition at the three day triathlon stage race in the Bahamas. For the third and final day of racing in the Island House Invitational Triathlon, the top ten female and male athletes on general classification relocated to the private island of Highbourne Cay for the final sprint distance stage to determine the overall champions at this unique event. Athletes started the race according to their deficit on GC to the overnight leaders, Jorgensen and Murray. On the women’s side Great Britain’s Ironman 70.3 World Champion Holly Lawrence dove into the water, 45 seconds behind Jorgensen with reigning ITU World Champion, Flora Duffy just 10 seconds further back. Duffy closed the gap quickly to Lawrence and the two worked to reduce the deficit to Jorgensen out of the swim to 30 seconds. Once on the bike, the duo went to work reeling in the Olympic Champion. “I knew I had to go hard from the start if I wanted to shoot for the win today,” acknowledged Duffy.” After catching Jorgensen at the beginning of the second lap of the three-lap bike course, Duffy attacked through the technical sections and gained time heading into T2. Lawrence was second off the bike but Jorgensen refused to allow the elastic to break and remained in close contact. On the run, the American used her dominant run speed to reel in her competitors, taking the lead by the 3km mark of the run. Once in front, there was no looking back and Jorgensen broke the tape first to seal victory for the second consecutive year. The men’s race was expected to be a showdown between the overnight leader on GC, Murray and non-draft specialist from the USA, Cameron Dye, winner of the third day’s stage at the 2015 edition of this race. Murray retained his lead through the swim but Dye quickly ate into Murray’s lead on the bike portion of the race. Despite his 30 second advantage off the bike, the buffer was not enough for Dye against Murray’s class on the run. The South African took the lead at the halfway point of the run and breezed to victory, even stopping to plant a kiss on his time trial bike before crossing the line. Dye crossed the line in second place but the battle for the third and final podium spot was a heated one with Australia’s Aaron Royle sneaking past Terenzo Bozzone on the run to claim 3rd place.